Because of the potentially harmful effects on both mother and child, finding a treatment plan that works is essential for those experiencing postpartum depression. Studies suggest that postpartum depression in the mother can negatively affect a child’s development and behavior later on. Postpartum depression is the most common medical complication that occurs after giving birth, occurring in up to 13% of new mothers. Fatigue, sadness, anxiety, and sleep disturbances are just a few of the negative symptoms associated with this disorder,and studies suggest that postpartum depression in the mother can negatively affect a child’s development and behavior later on. Because of these potentially harmful effects on both mother and child, finding a treatment plan that works is essential for those experiencing postpartum depression. Natural postpartum depression treatment is a safe and effective approach. Conventional treatment of postpartum depression focuses primarily on pharmacology and psychotherapy. However, many women are concerned that there is a lack of strong evidence evaluating the safety of depression drugs that are passed into breast milk. 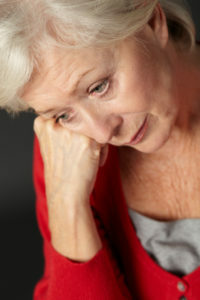 A study in 2002 classified some antidepressants such as the SSRI (selective serotonin reuptake inhibitor) trazodone as “possibly hazardous,” while many other common antidepressants were classified as “moderately safe.” Many women with postpartum depression seek safer, alternative therapies to treat their symptoms to avoid the possible risk of passing pharmaceuticals to their babies. What natural postpartum depression treatment options are available? 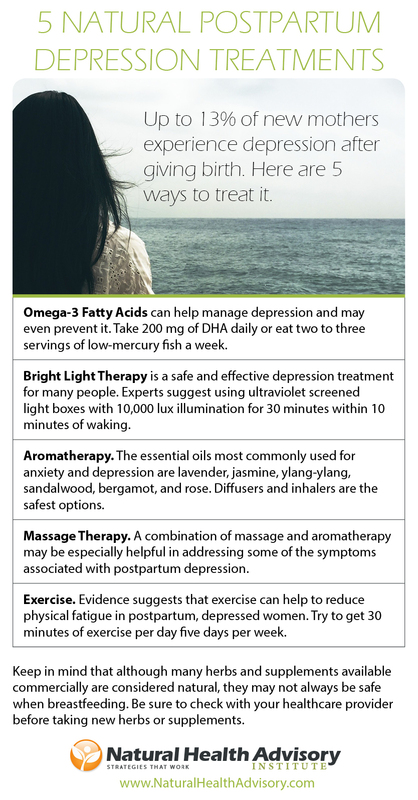 Several effective natural treatments for postpartum depression are available, ranging from supplements to aromatherapy. These treatments are considered safe for a mother and her breastfeeding baby, and are easy to incorporate into your care plan. 1. Omega-3 Fatty Acids are one of the most common supplements used to naturally treat depressive symptoms. They are safe to consume during and after pregnancy, and recent research has found that women with higher levels of the omega-3 fatty acid DHA (docosahexaenoic acid) are at a much lower risk of developing postpartum depression. Supplements of omega-3 fatty acids such as DHA can help manage your symptoms and even seem promising as a preventative treatment.Two to three servings of low-mercury fish a week is a good source of omega-3 fatty acids, or try a supplement of 200 mg DHA daily. 2. Bright Light Therapy is an appealing treatment option because it is safe and light boxes are available commercially. Authors reviewing the evidence for alternative medicine therapies for postpartum depression suggest using ultraviolet screened light boxes with 10,000 lux illumination for 30 minutes within 10 minutes of waking. 3. Aromatherapy. A pilot study in 2012 concluded that there were positive effects of using aromatherapy as an adjunctive treatment for postpartum anxiety and depression. The essential oils most commonly used for anxiety and depression are lavender, jasmine, ylang-ylang, sandalwood, bergamot, and rose. Find an aromatherapy specialist near you, or try experimenting with essential oils at home yourself. Diluted essential oils (usually in a 1% solution) can be sprayed into the air, used in bathwater, or rubbed onto the skin at the back of the neck, feet, or temples. Try out different types of essential oils to find one that suits you and your symptoms. Refer to this at-a-glance aromatherapy chart to get started. Be sure to use certified, therapeutic-grade oils for your safety. 4. Massage Therapy. Although long-term effects have not been studied, researchers say that “massage therapy may offer short-term improvements in mood and stress in the postpartum period.” A combination of massage and aromatherapy may be especially helpful in addressing some of the symptoms associated with postpartum depression. 5. Exercise. Moderate physical activity is recommended for all postnatal women, and the available evidence suggests that exercise can help to reduce physical fatigue in postpartum, depressed women. It is suggested that women do moderate-intensity exercise for 30 minutes a day, five times per week for best results. Search the Internet for “stroller exercise classes” in your area for an easy way to get exercise without leaving your baby. Keep in mind that although many herbs and supplements available commercially are considered natural, they may not always be safe when breastfeeding. Be sure to check with your healthcare provider before taking new herbs or supplements. Have you ever experienced postpartum depression? What natural postpartum depression treatment options did you try? How did you find relief from your symptoms? Please share your story below. Complement Ther Clin Pract. 2012 Aug;18(3):164-8. J Midwifery Womens Health. 2004 Mar-Apr;49(2):96-104. Best Pract Res Clin Obstet Gynaecol. 2014 Jan;28(1):85-95. Hale TW . Medications and mothers’ milk: A manual of lactational pharmacology . 10th ed . Amarillo (TX): Pharmasoft Publishing, 2002 . Int J Womens Health. 2010 Dec 30;3:1-14. Originally published in 2014, the post has been updated. alternative medicine, antidepressants, anxiety, anxiety and depression, anxiety and sleep, aromatherapy chart, breastfeeding, depressed, depression, depression drugs, depression treatment, depression treatment options, depressive symptoms, ed, exercise, health, lavender, light therapy, massage, mercury, milk, mood, natural postpartum depression treatment, natural postpartum depression treatment options, natural treatments, natural treatments for, omega 3, omega 3 fatty acids, physical activity, postpartum depression, postpartum depression treatment, serotonin, serotonin reuptake, serotonin reuptake inhibitor, skin, sleep, sleep disturbances, stress, supplement, supplements, trazodone, women's health, womens health.